Every PC and mobile security article on the internet recommends using a VPN. Even people who don’t know what a VPN is will still tell you to install a VPN. Here’s the thing: we all know VPNs are important, but most of you don’t actually use one. Today, we’re going to change that. Here’s how to protect your privacy on Android using a VPN. Why would you go all through the trouble of installing a VPN? What’s the point? What are the benefits? The first major benefit is security. Picture your internet connection like a river. That river is pouring out of your house and into the city downstream. Someone can look at your river of traffic, follow it upstream, and see where it came from. They can track the river upstream to your house. Now picture a VPN like a magic portal on that river. The river leaves your house, but instead of flowing down into the city, the river enters the portal. Instead of emerging in the city downstream, your river emerges in Cape Town, South Africa, or Yekaterinburg, Russia. Weird metaphors aside, VPNs let you mask your location all over the world. Some people use VPNs on Android to access America’s Netflix catalog, for example, while others use it to access the BBC. The only real downside to VPNs is that they either cost money, or they slow down your internet (usually both). Fortunately, there are a number of proven VPN providers serving Android today. Most are available through the Google Play Store as a free app download. Made by the same people who made the niche internet browser, Opera VPN is a popular VPN with an average rating of 4.4 stars out of 5 on the Google Play Store (over 43,000 reviews thus far). The VPN comes with useful features built-in, like the ability to block ad trackers and let you change your virtual location on the fly. It’s also completely free. 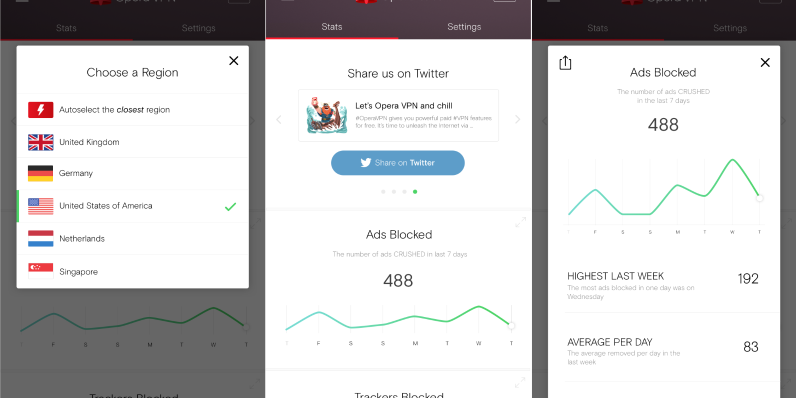 Another useful feature of Opera VPN is that it can help you analyze your network security, as well as your current encryption protection and privacy from threats. You can learn more about Opera VPN at their official website here. Or, download the app for free from the Play Store here. 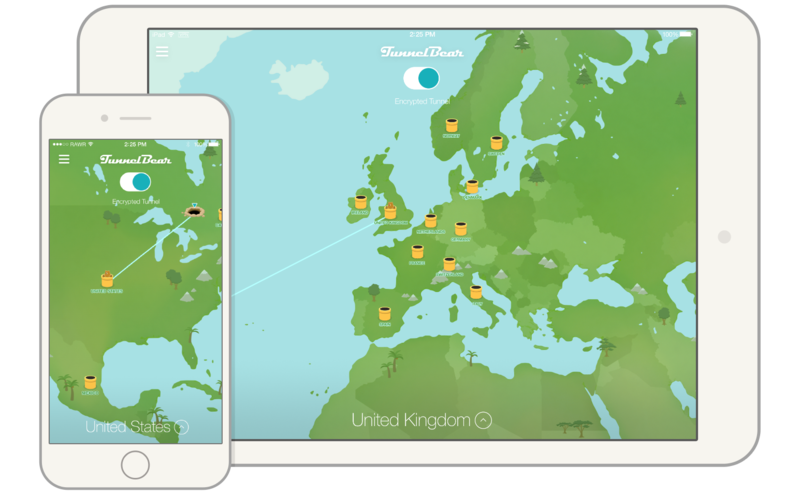 Tunnel Bear tends to be the most popular Android VPN. 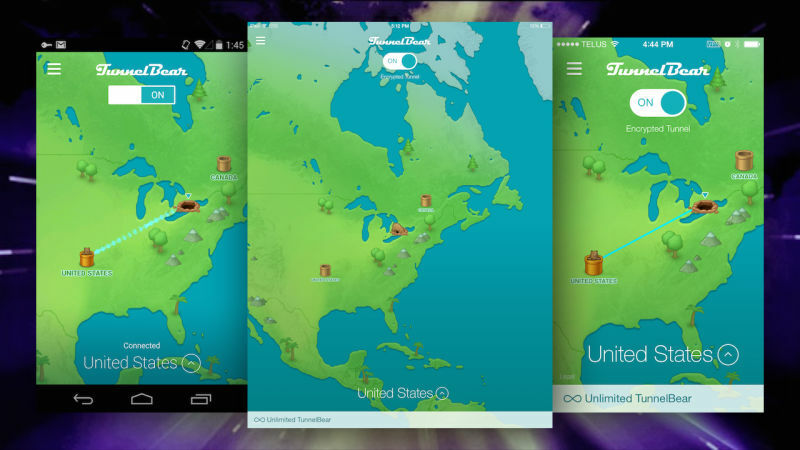 It features a colorful, intuitive interface where you can select your location on a map. Oh, and it uses an adorable bear as its mascot – so what’s not to like? Tunnel Bear has a wide variety of servers worldwide. The main restriction is that it’s only free up to a certain point. Free users get 500MB per month before being told to switch to a premium plan ($4 per month). That’s okay if you’re doing messaging and other basic tasks, but it’s not ideal if you’re watching more than one or two episodes on Netflix. Download Tunnel Bear for free today here. According to a report by our friends at Greenbot, this was the fastest Android app in their testing. Hotspot Shield “wasn’t even close” to the competition, reports Greenbot. Like most other VPNs on this list, Hotspot Shield uses plenty of ads. However, you can still navigate the app without accidentally clicking on anything. You can also sign up for a premium account for $12. Interestingly, Hotspot Shield’s $12 per month subscription extends to other deices – so you can use Hotspot Shield on Windows, Mac, and Android under the same subscription. Download Hotspot Shield free today here. Turbo VPN is an easy-to-use app that kind of looks like a blend between all other apps on this list. It’s a straightforward free Android VPN with one main drawback: there are only 5 server locations. That’s not that bad for a free VPN app. Out of all the free VPNs on this list, Turbo VPN has the most annoying ads. The app is still very usable, but those who freak out when they see an advertisement may not be impressed. You can download Turbo VPN for free today here. If you don’t like any of the ads on this list, then you can always use a manual VPN. Manual VPNs aren’t installed with the use of an app. Instead, you setup your own server and account through a private IP. By installing the free Android VPNs listed above, you can enjoy fast, private, secure browsing on any Android device – or, at the very least, you can finally watch US Netflix and Hulu.